Nedbank Cup quarterfinalists Black Leopards are not yet safe from relegation. Leopards went up to 13th spot on the Absa Premiership log after a goalless draw against Highlands Park in Venda on Sunday afternoon. The Venda-based side are just seven points ahead of bottom placed Maritzburg United with 10 games remaining. Leopards were unlucky not to earn maximum points after being denied by the post on three occasions. 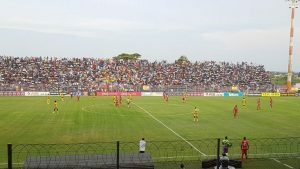 The homeside were reduced to 10 men when Khuliso Mudau collected two yellow cards within five minutes, which was his second successive red card. Meanwhile, Free State Stars have claimed the bragging rights in the provincial derby, by winning 3-2 away to Bloemfontein Celtic in an Absa Premiership match played at the Doctor Petrus Molemela Stadium in Bloemfontein. Stars, however, remain in the 15th position on the standings. They have 19 points from 20 encounters, while Celtic are in 8th place with 29 points from 21 matches. The post Black Leopards not yet safe from relegation appeared first on SABC News – Breaking news, special reports, world, business, sport coverage of all South African current events. Africa's news leader..